this release far more friendly and customizable. One of those areas is the Action Center. Action Center itself in Windows Phone is not new. It’s been there since Windows Phone 8.0 but it has been fairly limited in what it could do. Basically it was read only information on notifications. 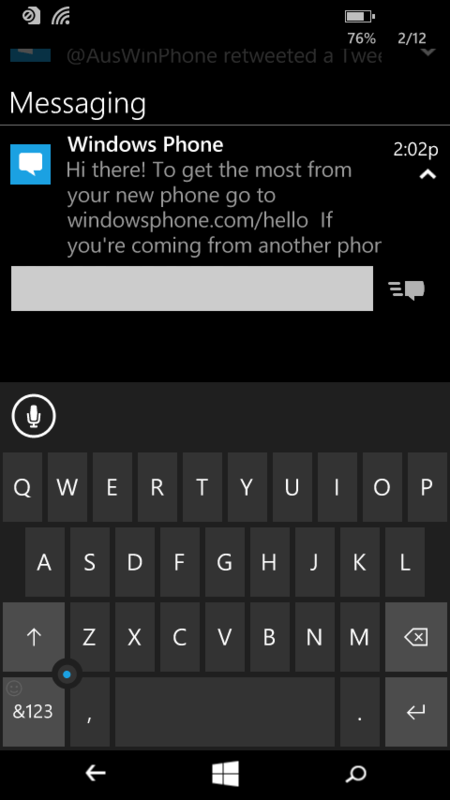 Now however in Windows 10 for Phone, it becomes far more interactive and, dare I say, useful. Now you will be able to interact with things like SMS messages or delete individual notifications for other apps and by the time Windows 10 for Phone is released, be able to interact with other Microsoft services like Skype. The key is you can do all of this without leaving the app you are in at the time on your phone. Quick Action buttons as it allows me to put my phone in flight mode with one tap and turn my GSM antenna back on with another single tap. In Windows 10 for Phone, this same customization is there through Settings>Notifications but there is also now a pull down menu in the Action Center where you can see an additional 8-10 settings. The concept Microsoft has is that the customized row of Quick Actions are the ones you access the most and remain customizable. The remaining ones however will be those that you need to access quickly but don’t necessarily access all the time. It saves you from having to go dive into Settings which, although dramatically improved in Windows 10 for Phone, is still a few taps away. What is unclear, at least in the Preview at this point, is if these additional Quick Actions will be customizable at a later point in the lifecycle of the beta or in the final GA of the release. Equally, it is unclear if the OS will “learn” what you tap the most in settings and adjust this Quick Actions list. Either of those options would be great to see. 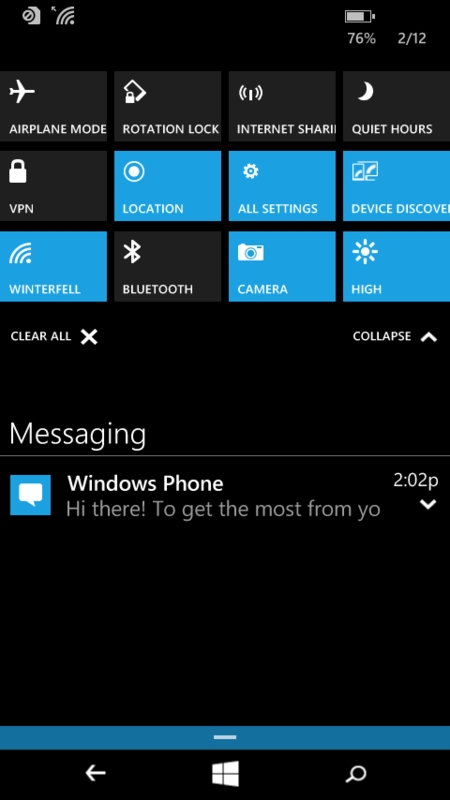 Another change coming to the Notification Center is how notifications are presented to you in Windows 10 for Phone. Today in Windows Phone 8.1 when you have an email or SMS notification, it comes in at the top of the display on your phone and you can either tap it to interact with it or wait… and wait… then wait some more for it to go away on its own. Now in Windows 10 for Phone you can dismiss them with a simple swipe up on your screen when the notification is displayed and continue to work in the app you are using at the time on your phone. If you are in Action Center itself, you can swipe to the right any individual notification and delete it from the notifications list. Today you can do a right-swipe to delete all of a particular type of notification (say from your Outlook email) but you can’t do individual messages. Finally there is the interaction with SMS’. Now instead of having to go to the Messages hub, in Windows 10 for Phone I can simply reply to a SMS from the action center itself or a notification. The building blocks here are more important though that what you can do today. Both Android and iOS have the ability to interact with a SMS message in their respective Notification Centers so really this is simply brining Windows 10 for Phone on par with the competition. However, Microsoft is planning far more with this as the platform matures towards release. This will include the ability to interact with messages from Skype and Lync for example. These are commonly referred to as IP communications and having those in the Action Center (which is already there) and being able to interact with them quickly without having to go into the individual app (which is not there right now) will be a huge advantage for the platform. Moreover, if Microsoft opens up the API to this for developers, suddenly many other IP communications could start happening for users such as Salesforce Chatter. There is a lot of potential in this small but important feature. Without question it is still early days in the development of Windows 10 for Phone and the Action Center will undoubtedly see changes during the process. That said, Microsoft is quite clear in what is seen so far in where they want this part of the OS to go in so far as it being more actually action oriented and not just notification oriented.